Hope each of you had a great week so far! My posting on here these past two weeks has been spars so I hope you guys don’t mind the random posting times. Do you? I had these fitting room snapshots sitting on my phone for too long, so before I cleaned out my phone photo album, I thought I’d share these as they’re quite nice. 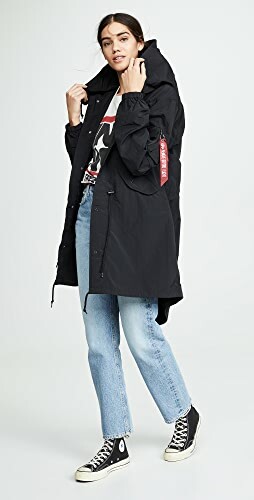 Before I start, my jeans are COH tts and my black booties are Marc Fisher...and I wear both way way too much (I’m very tempted to buy this color which is 50% off…but already have them in black suede too). 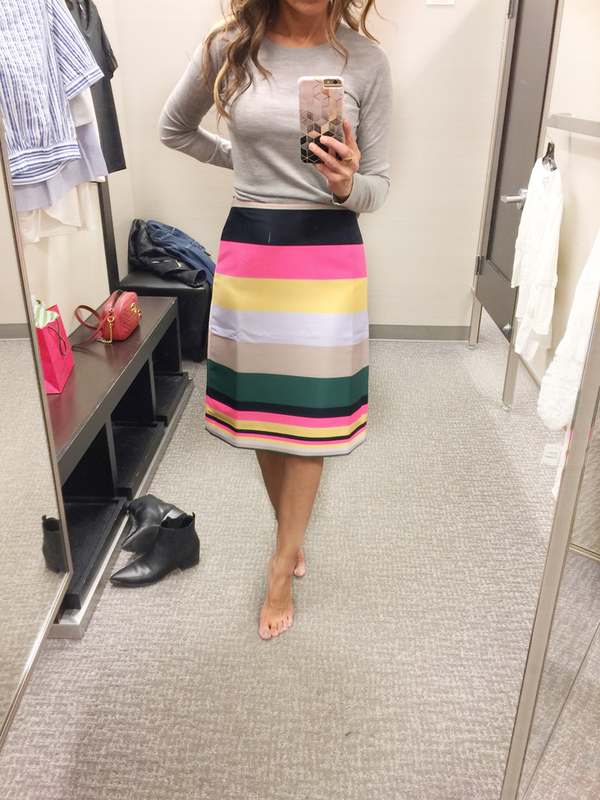 Also, Ann Taylor is having 40% off your purchase, so check out my latest AT fitting room snapshots here (Loft included) and here too. Xs was not available but I just had to try it on, in Small (I’d stick to xs). It’s definitely a little big but in a bad way. The sleeves are quite roomy but I think that’s the style. Lace top tts – LOVE! Loved everything about this top! 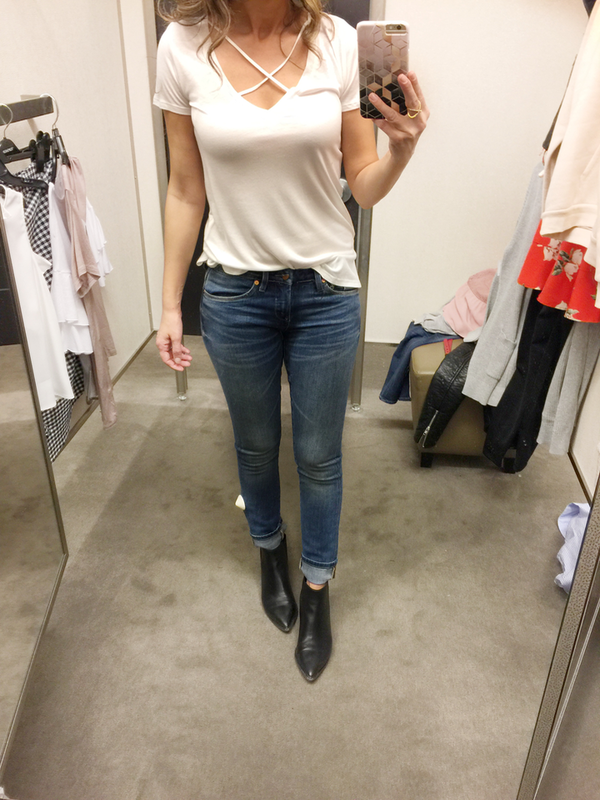 Jeans – loved the wash. They do run small and have no stretch to them. Shirred Crepe top – while a little pricey, this top is super nice. This one and the one above it were probably my two faves from these snaps. Roomy but it falls nicely. Xs was not available so I tried on Small. Would definitely stick to xs in this top. Top – cute casual top with a twist (literally). 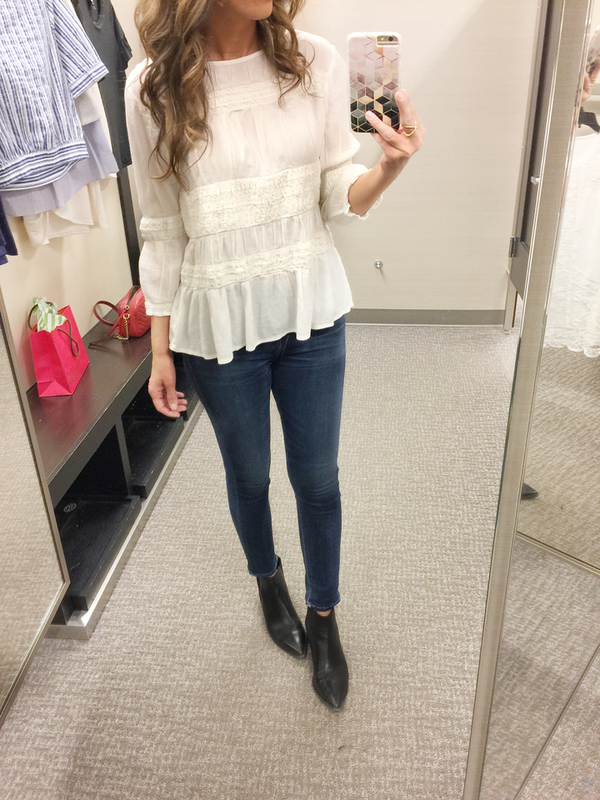 Cold Shoulder Top tts – soft! 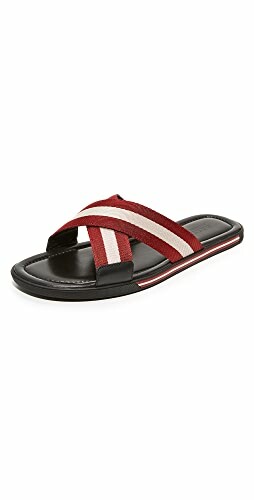 Comes in two more colors. 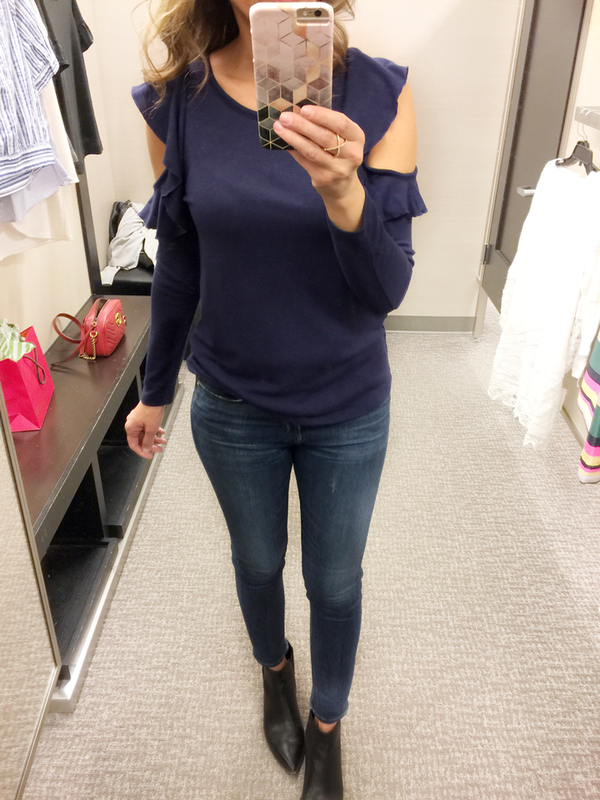 Cold Shoulder top – tts. Very cute! 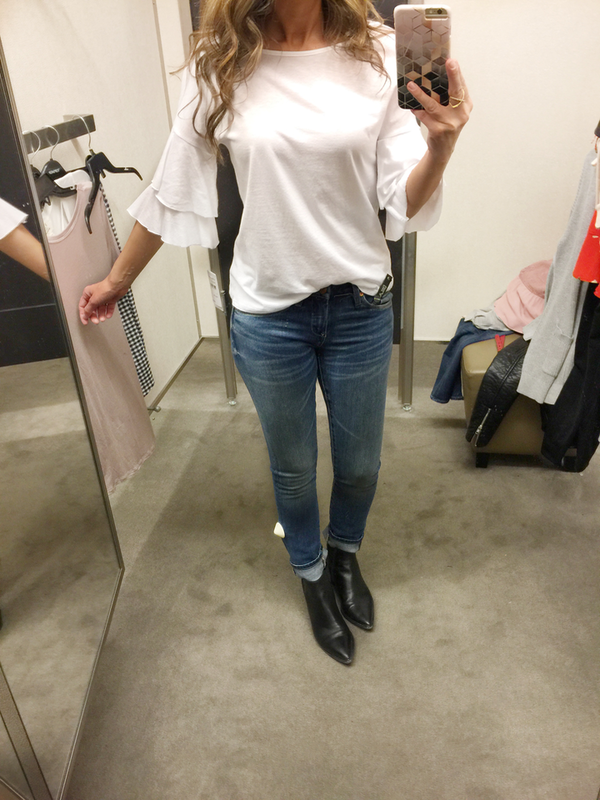 Ruffle sleeve tee – the material is t-shirt material which I personally liked. 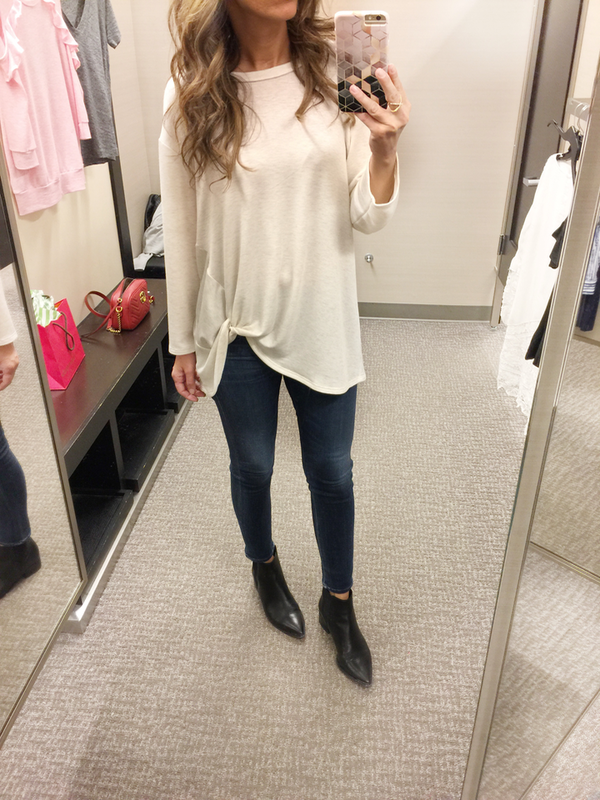 Bell sleeve tee – extremely soft! It comes in more colors. 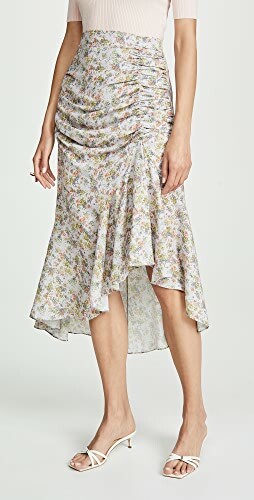 Skirt – runs a size big (at least it did for me). Love the vibrant colors, which can be paired with so many tops. 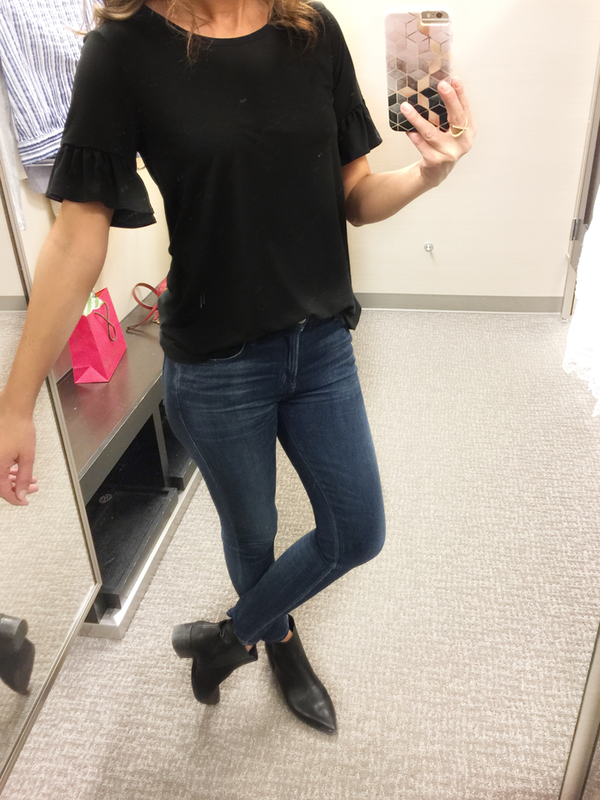 T Cross Front tee – super cute but it was just a little too low cut for me. 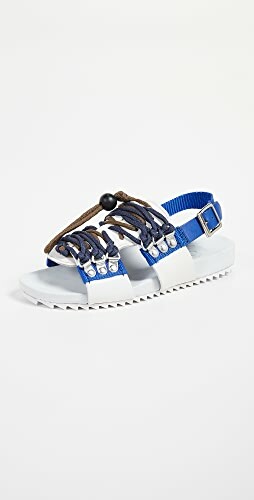 There is also this one that’s very similar style. Also, if you like the cross front you’ll love this blouse + the price is great. 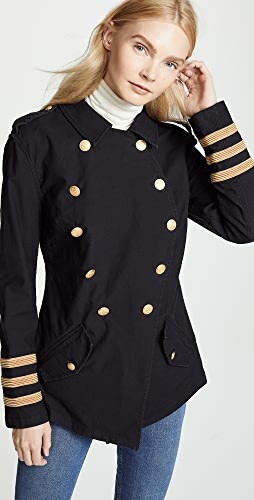 I’ve been eyeing this hoodies for ages but once again…my size, or the next up, was not available. While I don’t mind it extra roomy I didn’t want to go up 3 sizes (doesn’t look overly big but it was). It’s too short for me, buuuut I tracked down this dress in Tall. I tried on size 36 which supposedly is US4 but fits like 0/2. Just for proper breathing purposes I’d probably size up…unless I lost a couple of inches of my waist…which involves working out…is not very likely to happen. Just being realistic. Leather moto jacket – the jacket has a worn in look which I love! Gingham skirt – in love! 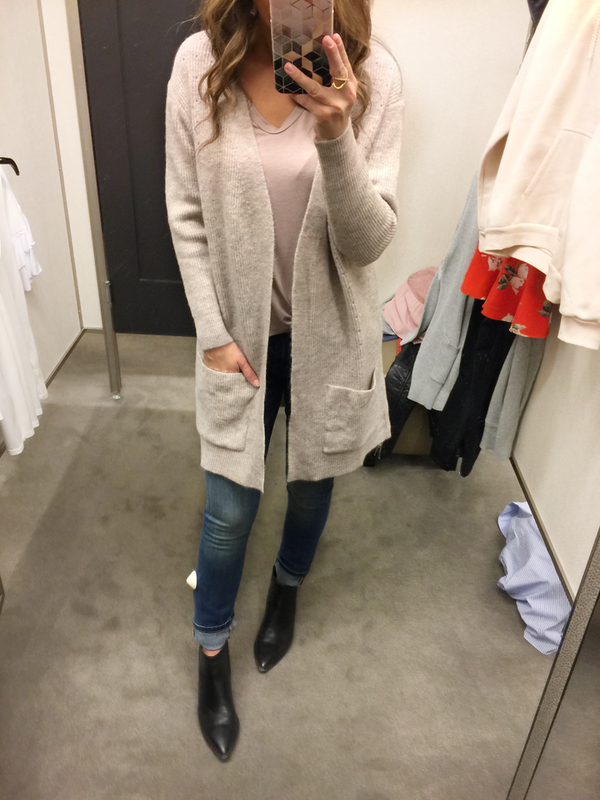 Cardigan – loved the color which is a mix of oatmeal with blush tones. 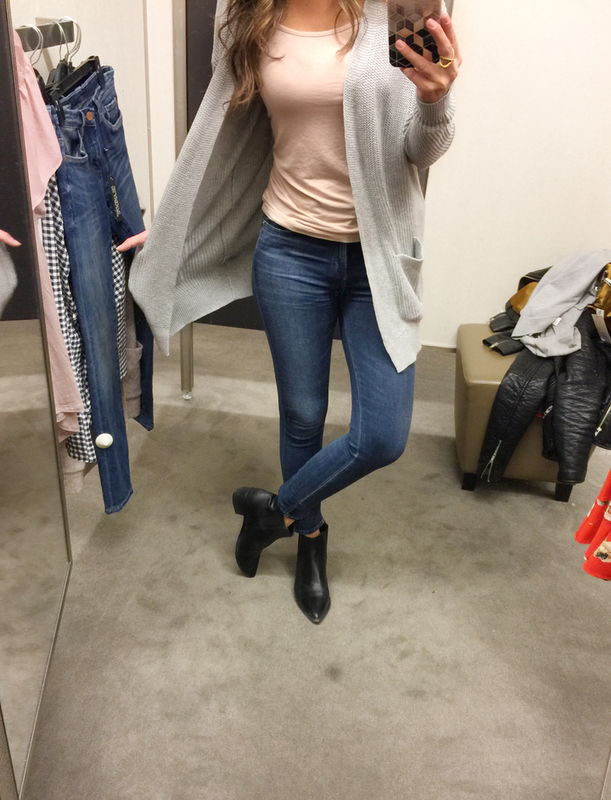 Gray Cardigan – great basic! 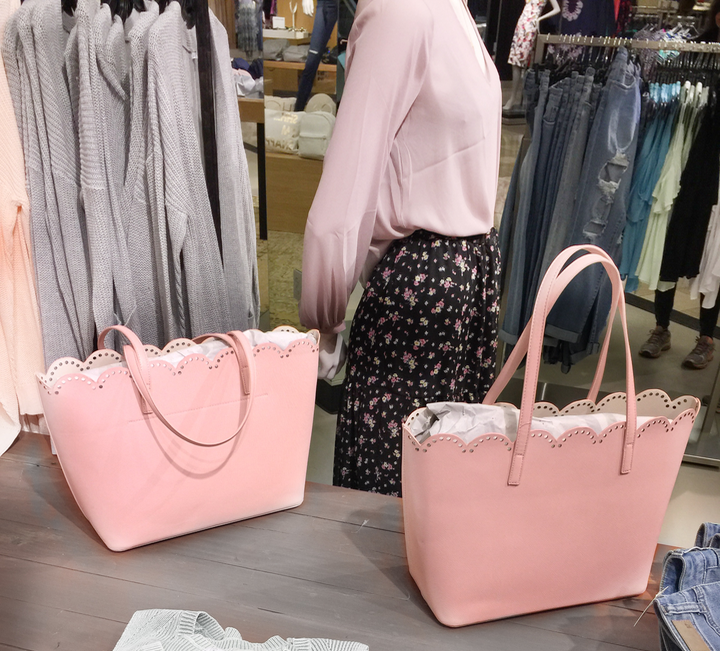 Couldn’t resist snapping a pic of these adorable scalloped totes (only $49). They remind me of the Kate Spade tote, just for a lot less $$. Just tried on two dresses and one I didn’t like so didn’t even bother to take pictures. 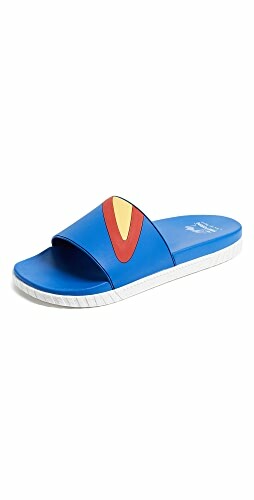 Flats are super cute, but I’ve been on the hunt for a pointy toe pair. And I so wish these were pointy toe because I LOVE the scalloped details and the color. 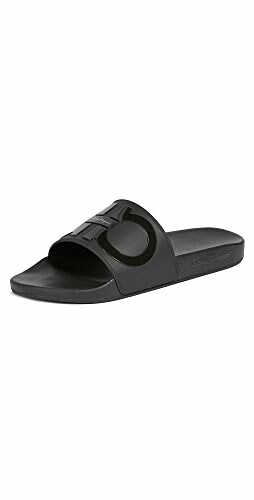 My actual size felt just a little snug in the toe area (which could have been from being on my feet all day) but 1/2 size up and they were too wide. 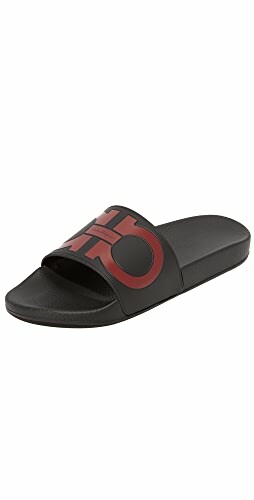 Guessing they would stretch out since they’re leather. 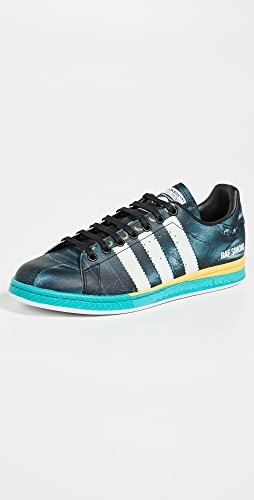 I’d stick to my actual size (the more I look at them the more I want them lol). Thanks Kristina, good to know. 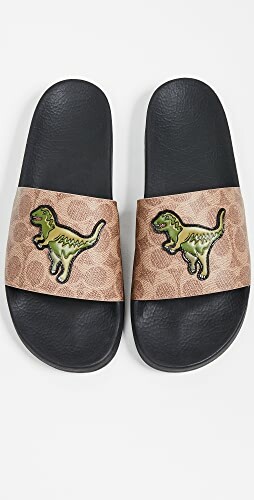 They are the cutest flats. Love it all! Your so cute! Haha right, too many cute pieces. Spring arrivals are too good this time. Lilly, how's the toe cleavage on those scalloped flats? 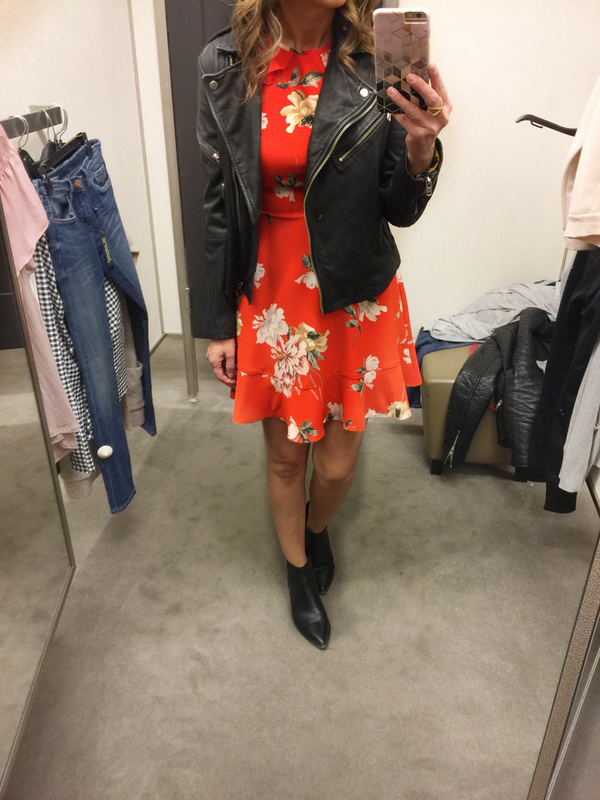 Love all the fun Springy things you tried on!! 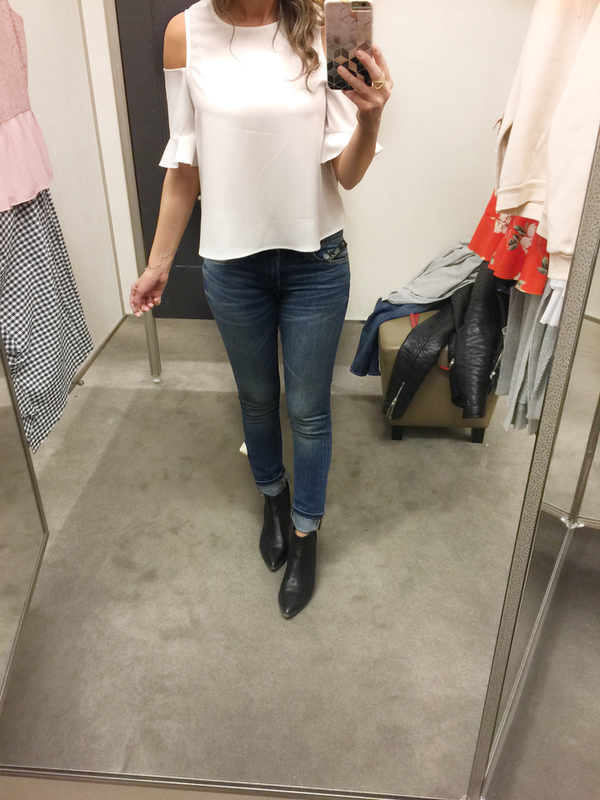 Surprisingly, I have a few of the tops from Nordstrom! I love the white dresses on you! 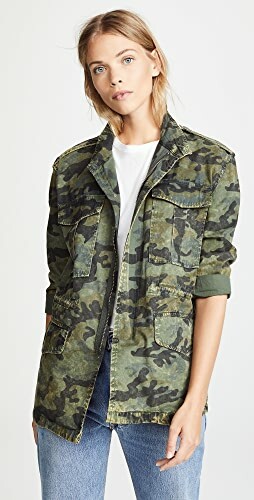 some of those Bobeau pieces are on Hautelook today for MUCH less! I love every single pick!! 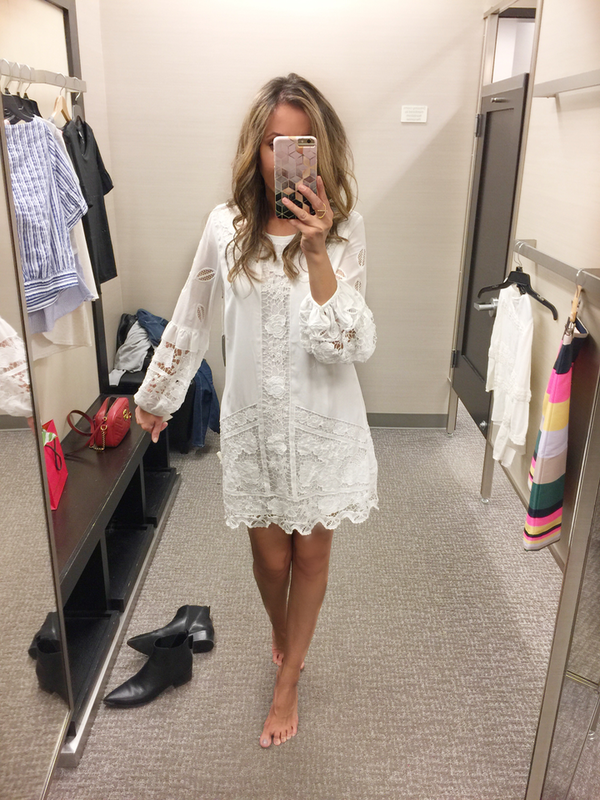 Lace shift dress is amazing. I love the scalloped totes…just ordered the one in blue. Love your fitting room snaps! Love the black bell sleeve tee and that Lace dress from BR. 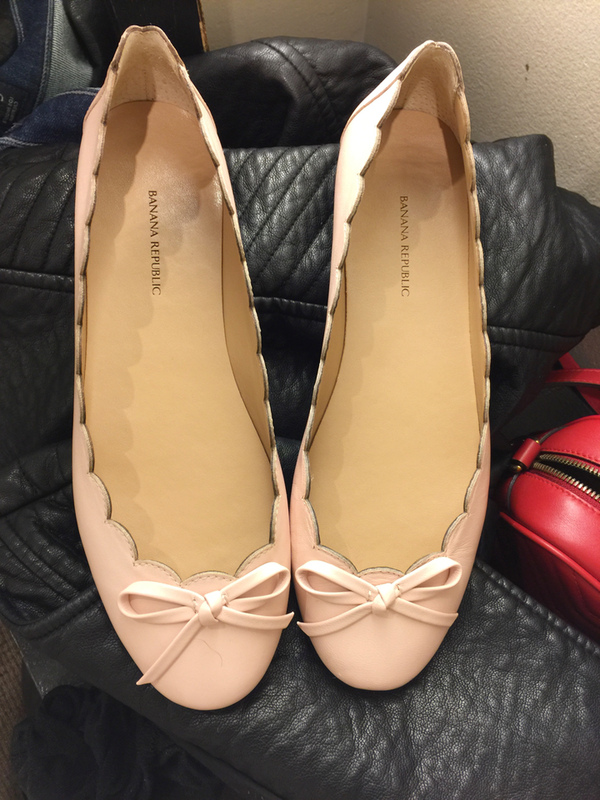 The scallop flats are super cute too. Random question…where is your phone case from? Love it!! 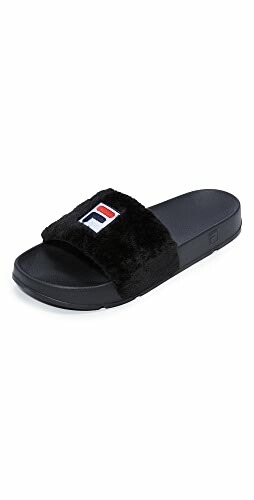 Shop Slipper Flats, Black Bodysuits, Cutout Dresses, Pink Flat Shoes and more. Get this widget.